Une légendaire adresse parisienne : Le Vaudeville. Le Vaudeville fait partie de ces établissements qui incarnent parfaitement la brasserie française dans son excellence. À l’intérieur, le cadre art déco à souhait, a été entièrement rénové pour laisser place à des banquettes bleu nuit, un magnifique sol en mosaïques, des marbres et des lustres en opalines qui maintiennent l’atmosphère du lieu emblématique. Au niveau de la carte, on retrouve une cuisine gourmande et conçue dans les règles de la tradition bistrotière ! Ce sont de sublimes plateaux de fruits de mer, des planches de charcuteries de la maison Conquet, la tête de veau, ou encore le tartare de boeuf qui sont proposés. C’est faisant face au somptueux Palais Brongniart, au centre de la capitale, que la brasserie fête ses cent ans. Arborant des stores crème et un espace aérien alignant d’élégantes assises tressées noires signées Drucker, la terrasse vous invite à vous asseoir autour d’une petite table ronde aux pieds de fonte pour vous offrir une vue dégagée sur la place de la bourse. 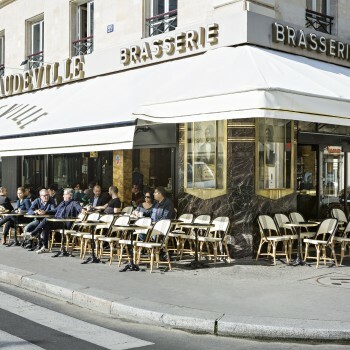 Though the TripAdvisor reviews may not yet reflect it, Le Vaudeville, one of the most legendary brasseries in Paris, is back. Following a sensitive renovation by new owners the Groupe Bertrand, it’s much better than it’s been for a longtime. To be sure, it’s not a place one heads to in search of gastronomic revelation, but rather for a good simple French meal when everything else is closed, it’s late, or you just want a meal in a pretty lively room without making a lot of fuss about the food. That’s what brasseries have always been about in Paris, a straightforward and expeditious feed with a good dose of Metropolitan glamour to boot. So we met there on a rainy Saturday night, and ate a mountain of oysters, followed by steaks for the gents and the grilled cod with mashed potatoes that’s still on the menu for Anne. Aided by a flood of white wine, it was a hilarious evening during which we discovered we had a lot in common in terms of everything from food likes to our politics and senses of humour. And so an enduring friendship was born. As a newcomer to Paris, I also loved the louche buzz in the room, and its beautiful art-deco decor, which dates to its rebuilding by Solvet Père et Fils, the same architects who designed another famous Parisian brasserie, La Coupole, after the original cafe on this site across the street from La Bourse, the old French stockmarket, had been destroyed by a German air-raid during World War I. And so through the years I ended up here rather often. For a big tray of oysters with a new lover, for a small tray of oysters when a lover left me, with friends after a movie, with my mother when I hoped that the animated room might arm me against her exasperating remarks, and with almost every Parisian friend I’ve ever had when we decided to have dinner at the last minute and hadn’t made a reservation anywhere else. 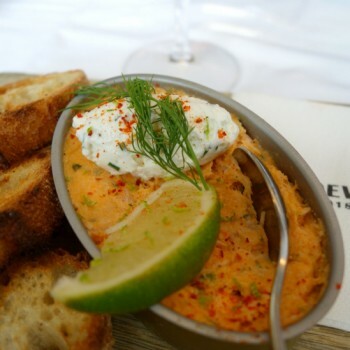 The food was, as the French would say, “correcte,” or reliably adequate, until this restaurant followed all of the other ones that were once part of the now defunct Brasserie Flo chain, and became mediocre at best and expensive for what it was. The charm of a meal here well and truly dented, I stopped going, except for the occasional oyster feast with Bruno, but even then, we preferred to take our oysters home with us from the shellfish stand out front rather than be seated in the dining room. Now, happily, this place has had a corporate reset. Respecting the restaurant’s DNA, the Groupe Bertrand has given it a needed freshening up, which has included a terrific new terrace and an excellent new bar program that features light eats with a glass of wine or a cocktail. You may be wondering how I ended up here again. Well, suffice to say that I try very hard not to be a food tyrant, which means being a bully when it comes to where we eat. Yes, as a Paris food writer I often have a list of new places I want to try that’s as long as my arm, but I find it keeps the peace in my couple, and is also actually rather useful, when I let someone else decide where we’ll have dinner. So when I returned home from a recent trip to Spain on a Sunday night, Bruno mentioned that he’d walked by Le Vaudeville and that it was looking wonderful after a freshening up. “Maybe it’s good again,” he said, hopefully. Stealthily, I did a little research on the internet, which is how I learned it had new owners. “Sure, let’s give it a try,” I told him, and off we went. A charming young maitre d’ greeted us when we arrived, but I still recognised several of the hard-working long-serving waiters from days of yore and hoped they were being well-treated by the new management. Hungry, we settled in on the terrace and shared a flight of excellent hors d’oeuvres, including charcuterie, onion rings, and accras (salt-cod fritters), with a flute of Champagne, because, well, because. Next, we tucked into a tower of impeccably fresh langoustines–when they’re fresh, their tails remain in a rigid curl rather than being flacid, and, because I am a child of suburban American steakhouses and was surprised to see it on the menu, an avocado-and-prawn cocktail in a sauce Marie Rose (mayonnaise with ketchup or tomato paste). Though it hardly rivalled my favorite version of this dish, which is served at chef Michael Lomonaco’s Porter House in New York City, it was perfectly pleasant. Other possible starters included onion soups, escargots, sea bream tartare, and fried smelt with tartare sauce. Though tempted by the butter-roasted lobster at a reasonable 29.50 Euros, I had a filet of beef with Béarnaise sauce for my main–a nice piece of meat, perfectly cooked and with a very respectable Béarnaise that was also good for dipping frites into, and Bruno chose grilled sole with haricots vert. Among other options, it was nice to see a choucroute garni on the menu here, and salmon tartare as a main course would be a good choice for summer dining or light eating. In the past, I never ordered dessert at Le Vaudeville, because they were eminently forgettable and never very good. But the ‘Angelina’ pedigree of the millefeuille tempted me, while the sagely more calorie-conservative Bruno went with a dainty, airy toasted-almond topped ile flottante napped in light caramel and a sauce Anglaise. Both were good, and walking home after dinner, I was happy that a restaurant which is such a repository of happy memories is once again a place where I might be happy going for an off-the-cuff meal with no hesitation. I was also glad that the beautiful etched glass art-deco door to the men’s room downstairs had survived the renovation. Rares sont les brasseries parisiennes pouvant se targuer de célébrer leur 100 ans. C’est le cas de la Brasserie Le Vaudeville, véritable institution nichée dans le 2ème arrondissement de Paris, juste face à la Bourse. Avec ses plats classiques de brasseries parisiennes et ses fruits de mer et crustacés, Le Vaudeville n’a pas fini de séduire les papilles des parisiens. Dans cette grande brasserie parisienne, au moins 200 couverts seront servis le soir du 31. Depuis deux jours, l'équipe prépare l'événement. C'est un branle-bas de combat tranquille. 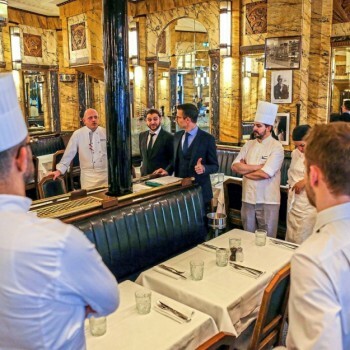 Dans la cuisine de la brasserie le Vaudeville, face à la Bourse, au cœur de Paris (IIe), depuis deux jours, on anticipe, on s'affaire et on s'avance sans trop compter son temps. « Tout doit être prêt pour que dimanche soir nous n'ayons plus qu'à cuire ou réchauffer les plats et dresser les assiettes. Parce qu'il va falloir aller vite ! » explique, très zen, Jérôme Markovic, le tout nouveau chef de ce célèbre établissement créé en 1912.